Wars both internal and external exert a large impact on the development of societies. The Byzantine Empire has always been in constant exchange and conflict with its neighbours and rivals due to its geographic position. Out of this arose a wide range of violent interactions with the Latin, Slavic and Islamic worlds, in addition to, as a consequence, manifold interrelationships between the respective martial cultures, which we define as the norms, interpretations, attributions of meaning and reflections related to war as well as its forms and practises. 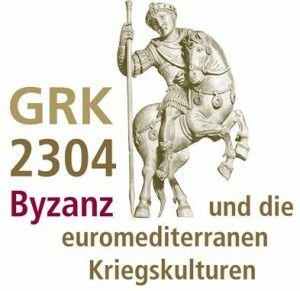 The aim of this Research Training Group is to analyse Euro-Mediterranean cultures of war and the importance of Byzantium for them in a transcultural perspective for the first time. Starting with the two overriding fields of study of “expressional forms” and “interpretative concepts”, these reciprocal processes of exchange, of distinction or also of reception will be analysed by means of four concrete subject areas: 1) strategies of justification and legitimisation; 2) conceptualisations of persons and groups; 3) rituals and cultic practises; 4) knowledge and infrastructure. The diachronic scope extends from the Roman Imperial Period, whose inclusion is indispensable for the understanding of Byzantine cultures of war, until the Early Modern Period, when the Byzantine heritage, especially in Eastern Europe, was still very vibrant. Within this interdisciplinary-orientated Research Training Group textual and visual sources, archaeological objects, visual sources, music as well as other media will be investigated in equal measure and brought in connection with one another, in order to grasp mentality and materiality and the related semantics of martial cultures. Based on this clearly-defined thematic complex, the immanent significance of Byzantium for the culture and history of the Euro-Mediterranean area will be explored in a thorough and systematic manner for the very first time. The qualification programme and supervision strategy are construed according to the individual needs of the Ph.D. candidates, whereby there are not only included methodological, theoretical and thematic training and activities aimed at networking and internationalisation, but also museum research practice and collection-related work. In this regard Mainz provides an ideal location, not only because of the subject variety of the Johannes Gutenberg University and the structures provided by it for research and advanced training (including the Research Unit Historical Cultural Sciences), but also through the involvement of the Roman-German Central Museum as well as the Leibniz Institute for European History. In the field of interdisciplinary scholarship on Byzantium the aforementioned partners have long cooperated via the Leibniz-ScienceCampus “Byzantium between Orient and Occident”, thus providing an inspirational and international environment for junior scholars. 6 positions for doctoral research associates to be filled by 01 October 2019. Click here for the program of events for SoSe 2019. Wednesday, 8 May 2019, 6.15 p.m.